The Ritz Club Casino is located in the heart of London's Piccadilly and will appeal to connoisseurs of luxury and elegance. The club is a privately owned, exclusive member’s club and places great emphasis on consistently upholding the highest standards of service. The Ritz assures you of nothing but the best right, be it exclusive membership or the friendliest reception, the finest food and drink enjoyed in the sheer luxury and, of course, the greatest gaming experience. The gaming area is set in what used to be the grand ballroom of the Ritz Hotel. 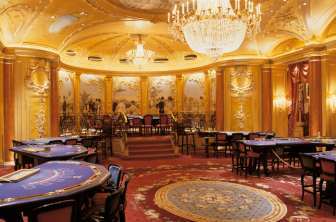 Across the two levels, seven American Roulette tables, four Blackjack tables, three Three Card Poker and two Punto Banco / Baccarat tables can be found. The Club's restaurant offers award winning cuisine and is known internationally for the highest standards of service. In addition, the club offers an excellent concierge service which procures tickets for top shows, sports and entertainment. Membership at the Ritz Club Casino is by application only and is open to individuals over the age of 18. Life Membership is available at £1,000 per member. Application forms can either be collected at the venue or downloaded from the casino website. Successful applications will be processed and new members will be required to provide photographic identification upon their first visit to the Club. The Ritz Club Casino is open 7 days a week for gaming from 2pm to 6am. The restaurant opens daily from 7pm till 3am. The bar opens at 2pm. The emphasis at the restaurant is on using the freshest and the highest quality ingredients and the menu is merely representative of what’s available. Guests can ask for whatever they want, irrespective of it being on the menu. The chefs at The Ritz Club have taken great care to create a unique fusion menu which caters to a wide variety of tastes. Dishes are based on different styles of cooking; for example, a French dish may incorporate lemongrass or Thai spices. The private rooms at the Ritz Club are complete with dining space and gaming tables and offer the most remarkable of venues, ideally suitable to launch a luxury brand or host a business meeting. The management is perfectly equipped to deal with every little detail from right from the menu to the décor.